Washington State University Global Campus’s high-demand undergraduate and graduate degrees—offered 100% online—combine the convenience and flexibility of online learning with the high-quality academics and stellar reputation of WSU. As a Global Campus student, you will earn the same diploma, with the same prestige and respect, as all WSU alumni. Regardless of their campus, all WSU students are full members of the WSU Cougar community, with all the pride and advantages it entails. 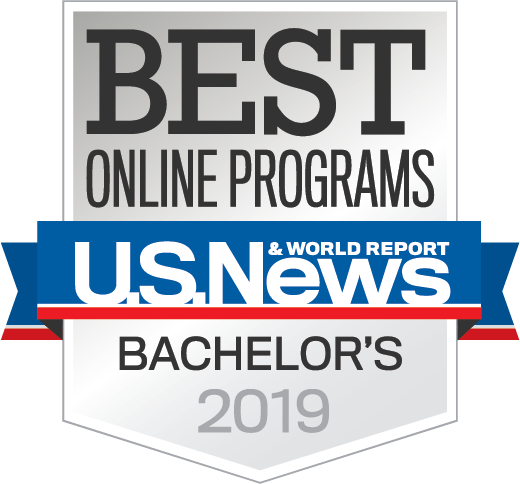 You don’t have to take our word for it: U.S. News & World Report ranks WSU Global Campus as one of the top 5 percent best online undergraduate programs in the nation. Choose a category to reveal the available undergraduate degrees. WSU’s accounting major, available 100% online, prepares students for rewarding careers in the growing field of accounting. The program provides a strong base in management fundamentals, accounting information systems, accounting practice and critical thinking. Students will graduate prepared to work in private business enterprises, Fortune 500 companies, national and international accounting firms, government agencies, consulting firms and non-profit organizations. WSU’s criminal justice degree program, available 100% online, combines problem-driven research and real-world expertise to prepare students to be leaders in local, state, federal and private law enforcement. Graduates can use the advanced critical-thinking skills and practical knowledge gained from the program in a wide variety of diverse career opportunities, including crime analysis, community corrections, victim advocacy, child protective services, border security, cyber-crime prevention, security/loss prevention and court administration. WSU’s Bachelor of Science in Data Analytics—offered 100% online—prepares students for careers in the emerging, high-demand field of big data. The curriculum includes interdisciplinary courses in data analytics, computer science, statistics, math and communication. Graduates will learn the tools and techniques to collect, manage, explore and analyze large, complex datasets. They will also gain the ability to effectively communicate data-driven findings to help organizations in a wide range of industries to make better business decisions. The skills you will learn are highly transferable, and graduates can use their knowledge to bring value to a wide spectrum of industries. WSU’s economics program, available 100% online, trains students to become critical thinkers and excellent communicators with advanced data analysis skills. Graduates will be prepared to evaluate and apply economic concepts and quantitative methods, think critically, integrate concepts, and evaluate and clearly communicate the results of economic analyses. Economics students can go on to careers as economists, statisticians, data analysts, advisors, revenue agents, loan officers, and in government service. A bachelor’s degree in economics is also excellent preparation for earning a graduate degree in economics, getting an MBA, or going to law school. WSU’s undergraduate history major—offered fully online—helps students develop critical thinking, quantitative and symbolic reasoning, research abilities, information literacy, and communication skills, and equips students for the changing demands of the workplace. Students will have the opportunity to study many different historical topics, including world, American west, environmental, religious, gender, military, European, and diplomatic history. An undergraduate degree in history can lead to work as a historian, archivist, librarian, information specialist, writer, teacher, researcher or in government service. History students can further train for careers in business, law, and politics. WSU’s hospitality business management program—now available entirely online—is designed to help students learn the fundamentals required to advance in this fast-growing and wide-ranging industry. Acclaimed WSU faculty members bring extensive hands-on industry experience to the curriculum. Graduates will gain expertise in operations, revenues and cost controls, sales, service, event planning, and leadership, and will learn to apply those skills to careers at hotels, restaurants, sports and convention centers, senior living communities, and tourist destinations, both in the U.S. and across the world. WSU’s human development bachelor’s degree—available entirely online—prepares graduates for employment in a wide variety of careers, including positions with such programs as Head Start, child-care centers and preschools, social service agencies, juvenile justice, the YMCA and senior centers. Students may also earn a certificate in early childhood education or gerontology (the early childhood education certificate is available for Washington state residents only). WSU’s Bachelor of Arts in Humanities degree—available 100% online—allows students to select courses and learn about cultural concepts through literature, art, music, theater, philosophy, history, languages, and linguistics. They develop a unique, customized and integrative degree plan that will focus on their individual values, interests, and aspirations. Graduates can find employment in areas linked to business, communication, education, human resources, social services, and many others. The degree also opens the door to many graduate and professional programs. WSU’s integrated strategic communication major, offered 100% online, provides a broad-based curriculum that focuses on both traditional and digital media. Coursework in the program emphasizes theoretically grounded, data-based decision-making to innovatively solve problems. Graduates will acquire the skills they need to prepare for careers in corporate communications, social media, community and media relations, advertising and public relations. Job opportunities are available in public relations firms, advertising agencies and in virtually all businesses and industries that require the expertise of communication professionals. WSU’s management major—offered 100% online—provides a well-rounded curriculum designed to prepare students to launch or advance a career as a professional manager. Management majors will learn how to lead and motivate people, anticipate change and improve the planning, structure and operation of an organization. The skills and knowledge graduates gain as a WSU management major are applicable to business of all sizes and types. WSU’s management information systems major, offered 100% online, teaches high-level IT skills and the ability to apply them in a dynamic business environment. The curriculum focuses on technical, business and managerial knowledge. You will learn to collaborate with non-technical colleagues, assess an organization’s IT needs, and design information systems to meet those organizational needs. Courses include extensive hands-on experience in building software applications. WSU’s marketing major—available 100% online—builds a strong foundation in business fundamentals while offering courses in consumer behavior, marketing research, promotion management, marketing management, international marketing and elective business courses. Graduates will learn both valuable knowledge and practical skills designed to prepare them for exciting careers in the dynamic field of marketing. Career opportunities in marketing include positions as a sales representative, consultant, marketing associate, retail manager, or advertising specialist. Experienced marketers may also hold senior positions such as director of marketing, market research manager or brand manager. WSU’s Bachelor of Science in Psychology—available 100% online—gives students a comprehensive understanding of psychological principles and the field’s use of the scientific methods. The ability to systematically identify and solve human problems is crucial skill in all workplaces and life situations. A psychology degree is an excellent stepping stone to graduate work in psychology, but also provides invaluable skills for those interested in a wide variety of career fields, including health care, social work, law, research and development, business, management, sales, marketing and administration. WSU’s undergraduate degree in social sciences, available 100% online, teaches students marketable skills that employers value, including critical thinking and analysis, cultural awareness and sensitivity and effective communication skills. Graduates have many career options, including business, social services, law enforcement, education, government, and public service. The degree also provides a solid foundation for pursuing advanced degrees. WSU’s undergraduate sociology major, available 100% online, develops skills in critical thinking, quantitative and symbolic reasoning, research methods, information literacy and communication. You will develop an in-depth understanding of fundamental features of society—including diversity and inequality, the problem of social order, and the intersection of society and the environment. These multi-disciplinary skill sets and knowledge prepare students for a wide range of exciting career opportunities, including, but not limited to, social work, healthcare, education, criminal justice, law, politics, business, and marketing. Choose a category to reveal the available graduate degrees. WSU’s Master of Science in Agriculture (MSAG) program—offered 100% online—is designed for agricultural professionals, practitioners, and educators who wish to gain knowledge and skills and boost their careers. The program provides a solid core curriculum in agricultural science focusing on valuable practical knowledge and skills for agricultural professionals. The degree’s flexible, fully-online format is ideal for working professionals who want to achieve their academic and career goals with continuing with their careers. WSU’s Professional Science Master’s (PSM) in Electric Power Engineering—offered 100% online—combines advanced technical courses with professional management training to help students achieve high-paying employment. Professional Science Master’s, or PSM, is an innovative and relatively new type of degree program that trains students in an advanced scientific field while also teaching them the skills to be leaders and managers in a professional environment. Graduates will gain both an in-depth knowledge of electric power engineering and the managerial skills needed to advance in this industry. WSU’s Engineering and Technology Management (ETM) program—offered 100% online—prepares engineering and business professionals to make strategic and operational decisions and become leaders in the management of technology. Courses provide practicing engineers with the knowledge, tools, and skills to manage projects, operations, organizations, and people. The ETM program is specifically tailored for professionals who want to advance their careers while still working full time. Live, online lectures are available from anywhere and at anytime. WSU’s Executive Master of Business Administration program—offered entirely online—allows students to learn executive-level business concepts and strategy from accomplished faculty with real-world experience. Executive MBA students will gain in-depth knowledge as they navigate rigorous coursework with peers from different disciplines, leading to advanced expertise in high-level business leadership. The program also puts a high emphasis on student engagement. WSU’s Master of Science in Agriculture (MSAG) program, Food Science and Management option—offered 100% online—is designed for agricultural professionals, practitioners, and educators who wish to gain knowledge and skills and boost their careers. The Food Science and Management option provides students with a solid core curriculum in agricultural science focusing on valuable practical knowledge and skills for agricultural professionals. Students will also take courses specializing in food science, food industry practices, business and management. This combination of science and business curriculum prepares graduates to be uniquely qualified to meet the increasing demand for managers who understand science and research as well as business and industry economics. WSU’s master’s degree in Health Communication and Promotion—offered 100% online—is designed for those who work in communication and health sciences and are seeking to refresh and update their professional skills to enhance their careers. The program provides a solid core curriculum, consisting of classes in multimedia content creation, crisis communication, professional ethics, and research methods. In specialized courses in health communication, students will learn health behavior change theories relevant for prevention messaging, message creation and design for effective information distribution, and techniques for effectively communicating health information with specialized populations. WSU’s Master of Business Administration program—offered entirely online—helps build confident business leaders by delivering a robust curriculum with an emphasis on entrepreneurship and global business. The program also puts a high emphasis on student engagement. WSU’s Molecular Biosciences Professional Science Master’s program, available 100% online, combines science with training in business and ethics, bridging the gap between academia and the workplace. An innovative and relatively new type of degree program, a Professional Science Master’s, or PSM, trains students in an advanced scientific field while also teaching them the skills to be leaders and managers in a professional environment. Graduates will gain in-depth knowledge of molecular biosciences, with graduate courses in molecular biology and bioinformatics. The nationwide shortage of scientists with managerial and business training means PSM graduates will be well positioned for rewarding employment. WSU’s Master of Science in Agriculture (MSAG) program, Plant Health and Management option—offered 100% online—is designed for agricultural professionals, practitioners, and educators who wish to gain knowledge and skills and boost their careers. The Food Science and Management option provides students with a solid core curriculum in agricultural science focusing on valuable practical knowledge and skills for agricultural professionals. Students will also take courses specializing in plant health, agricultural pathology, business and management. This combination of science and business curriculum prepares graduates to be uniquely qualified to meet the increasing demand for managers who understand science and research as well as business and industry economics. WSU’s Master’s in Software Engineering program—offered 100% online—is specifically designed for workplace advancement. Course requirements were created with input from an industry advisory board that includes representatives from pioneering tech companies. Upon graduation, students will be well prepared to apply their knowledge and skills to implement high-quality software, provide innovative solutions, and take leadership roles in industry and government. Graduates can choose to pursue a career as software developer, software engineer, requirements engineer, quality assurance engineer, project manager, and many others. WSU’s Master of Education (EdM) in Special Education degree—offered 100% online—is designed for educational professionals wishing to extend their knowledge and skills in education, expand their understanding of special education practices and strategies, and pursue leadership roles in schools, organizations or agencies. The program is designed to address the Washington State Special Education Core Competencies for special education teachers and aims to prepare students for roles in teaching and leadership in this field. The program also gives certified teachers the preparation for the state endorsement they need to teach pre-kindergarten through 12th grade special education in Washington State. WSU’s master’s degree in Strategic Communication—offered 100% online—is designed for those who want to excel in communication, advertising, public relations and corporate communication. It’s also ideal for individuals who wish to enter this field by earning trusted credentials from a university noted for excellence in communication studies. This degree program provides a solid core curriculum consisting of classes in multimedia content creation, crisis communication, professional ethics, and research methods. Students will also receive hands-on training in the most advanced platforms, tools and techniques. The program’s multidisciplinary approach offers expertise in both new and traditional media, critical knowledge and skills for today’s innovative communications environment.